Summer 2016 CAL.. Sunshine and Shells Hat… Week 2~Beginning the Hat!! I’m so excited you are joining me this summer for a quick and easy Crochet Along!! 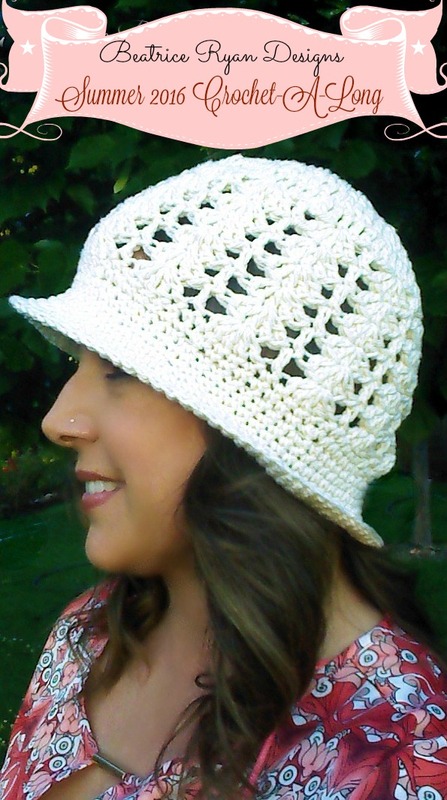 The Sunshine & Shells Hat is a fun project that is perfect for summer fashion and best of all… This is a Free Pattern! Beginning Shell Pattern: Ch 3, Skip 2 Sts, 5 Dc in next St, Skip next 2 Sts. Shell Pattern: Dc in St, Skip 2 Sts, 5 Dc in next st, Skip next 2 Sts. Note: Pattern is worked in the round and all joining stitches are joined to the beginning stitch. Row 3: Ch 2, *2 Dc in first St, 1 Dc in next St*, Repeat **around, Join. = 36 Dc. Row 7: Chain 3 (Counts as 1st Dc now and throughout), Skip next 2 Sts, 5 Dc in next St, Skip next 2 Sts (Beginning Shell Pattern made), *Dc in next St, Skip next 2 Sts, 5 Dc in next St, Skip next 2 Sts* Shell Pattern Made, Repeat** 11 times. Join to the top of Ch 3. = 12 Shell Pattern Repeats (including Beginning Shell Pattern). Rows 8-12: Repeat Row 7 five times. 2016 Summer CAL~Sunshine & Shells Summer Hat!! Week 1~ Materials and Gauge! Summer 2016 Crochet Along… Sunshine & Shells Hat – Week 3! So excited for this! Started mine this morning ? ?